new media. new ideas. : Can really, really, REALLY bad advertising actually be good? Can really, really, REALLY bad advertising actually be good? AdAge reported today that the nominations are piling in for the worst in TV advertising. Personally I think that with the heaps of turds being passed off as 'quality programming' it makes sense that the ads they seem to slot in every 90 seconds are every bit as horrible. According to AdAge: "...This year, Consumerist is tapping the reservoir of demand for angry consumer retribution by creating the first Worst Ad in America awards, which, like the Tracy's, celebrates the foulest marketing fumbles based on user-submitted suggestions. Their list of nominees will be unveiled tomorrow, and trust us, it's cringeworthy; contenders for top prizes include Quiznos' nightmarish singing-kittens spot http://www.youtube.com/watch?v=G5KhP11BRj4 (which Hartley mentions is a shoe-in for a Tracy this year, as well) and the decidedly uninspired "Not Without My Coffee" guy from those McDonald's ads. (For a full list of nominees, check back tomorrow for a link to Consumerist's ballot. UPDATE: Here it is.)" You have to wonder. I'm not a big TV watcher. In fact, I tune in to a total of maybe a couple hours a month. 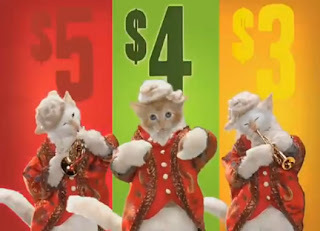 I've NEVER seen the Quiznos' singing cat commercial and I'm glad I didn't. It is really, really, REALLY bad advertising. Not to dis my adorable and uber-creative 9-year-old daughter, but it's something she would have produced if I had thrown a bucket of money at her and told her to make a spot. But here's the thing. I saw this as once. I remember it's promoting their $4 sandwich menu. Plus, now I'm blogging about it. Not that anyone reads my blog, but it's ingrained in my consciousness. I know Quiznos has $4 sandwiches. And over 40,000 people have watched this horrible ad on YouTube. Something is working here. I think it's like watching something like Jersey Shore. It's the car wreck syndrome. We hate to look but there's some twisted, deep-seeded part of us that makes us incapable of looking away. I guess for Quiznos, super-annoying singing kitten puppets are more palatable with a lunch promotion menu than car wreck victims' assorted body parts strewn along the I-5. And I remembered I can get a $4 toasty sandwich at Quiznos. Too bad I'm a Subway loyalist. Too bad you're a Subway loyalist, because Quizno's is really worth the $4.